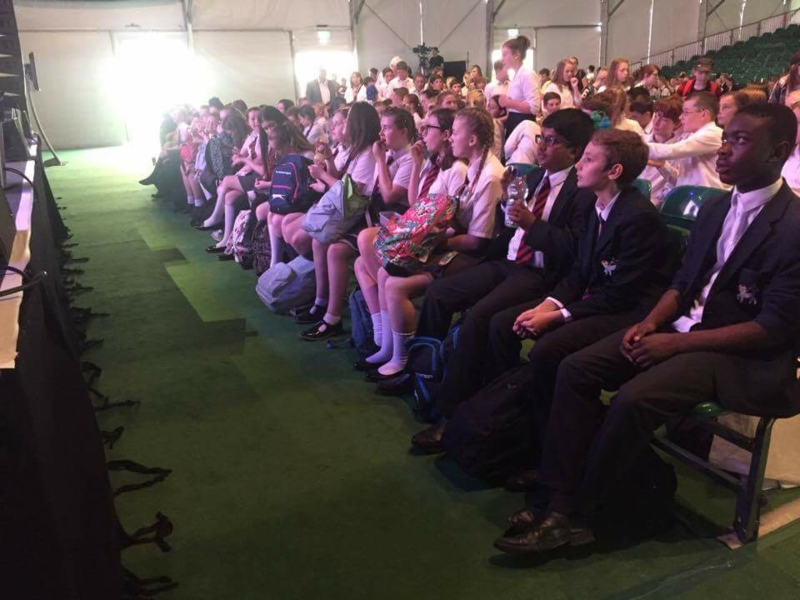 On Friday 26th May 2017, myself and a collection of year 7 through to year 9 pupils, recognised by English teachers as those who excel at or are passionate about the subject, embarked upon a journey to what is considered a bookworm’s haven: the Hay Festival Wales, situated in, as the name suggests, Hay-on-Wye. The cost of the trip was covered by the school, meaning that all of us were left with a fantastic opportunity to go and appreciate Hay’s celebration of the arts. I believe I speak for all students involved when I say that it was a thoroughly enjoyable day. Once we arrived at the Hay Festival, we were quickly ushered into the Tata Tent by security, where we sat amongst other schools from both England and Wales to view Ali Sparkes’ set, where she spoke of her new book, Car-Jacked, a story centred around a genius, namely Jack, and the hunt for him by his over-protective mother, Leonie, who home-tutors and coaches him on competitions and his diet- hence, Jack isn’t the keenest to go back when he is abducted. 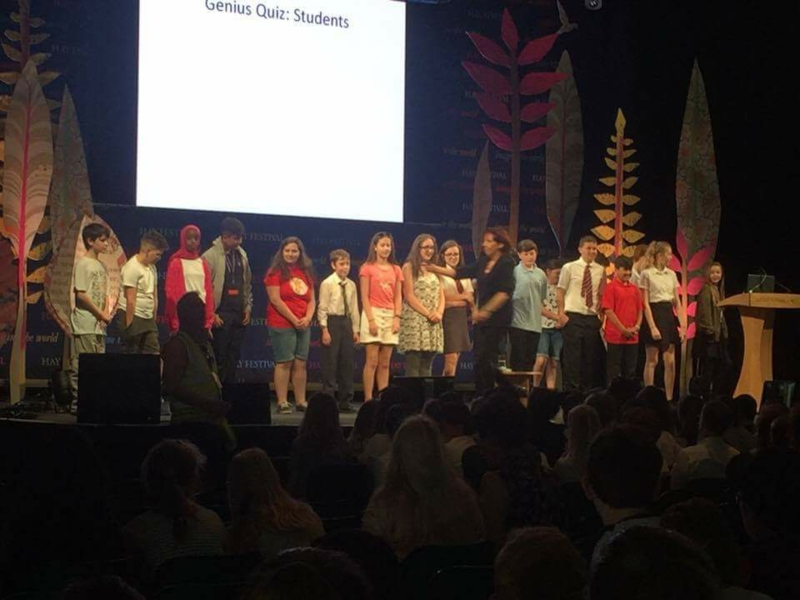 She spoke to us about the research she went through in order to accurately represent what it’s like to be a ‘genius’ in her book, and as part of this invited several audience members, both students and teachers, to the stage to undergo a genius test. I was one to go up as part of the student’s sector, but unfortunately didn’t pass (who knew Forest Gump wasn't written by Stephen King?) but Mr Toghill, assistant headteacher who accompanied us on the trip, was the only teacher who won the test against all of the other schools! After this, we had a short ten-to-fifteen minute break before we went back into the tent to have front-row seats for the next ‘act’: The famous storyteller Daniel Morden, who enchanted us all with his tale of a young girl, a mother-come-witch, and a romance. The way in which he spoke was amazing- with passion, his exaggerated hand gestures and accents accompanying his tale. Afterwards, he did a session on storytelling, telling us about his storytelling process in the form of a Q&A, before he left to complete a signing on his new book, Dark Tales from the Woods, which he told his story from. It was after this we were able to explore and see for ourselves what Hay was about, as we were able to venture around the festival at our own pace, free of teachers as we browsed books, food courts and the entire site, really, underneath the summer sun. The whole place was swarming with school children, collecting under trees for shade, delving into packed lunches, some laughing amongst themselves and others with heads buried inside newly bought books. The extensive Oxfam bookshop was impressive, as although the lines were long, the books were cheap and book haters and worms alike all collected around to see if they could pick up something they fancied. It was impressive to see the amount of diversity in one place, with everyone setting aside their differences to experience the ethos of Hay and, of course, try to get interviewed by Blue Peter. Unfortunately, we only had a few hours to walk around before we had to make it back to our bus in order to get back to school on time, but it was the sort of place you could spend a lifetime in, just wandering around and enjoying the mood. But, of course, we had to leave at some point, and as we waved goodbye to Hay Festival on our bus and posed for pictures in front of the colourful ‘Hay Festival’ sign, we realised how amazing the place was, how a week long festival could bring together so many like minded people into a small area and do such good things around the world, and how Hay really is a special place. Written by Kaya Davies, year 9.